Aston Villa have sacked manager Steve Bruce after winning only one of their past nine Championship matches. Villa are 12th in the table and drew 3-3 with bottom club Preston on Tuesday. The 57-year-old, who was appointed two years ago, had been under increasing pressure from Villa supporters, with one fan throwing a cabbage at him before Tuesday's game. He led the club to the Championship play-off final last season, which they lost to Fulham at Wembley. 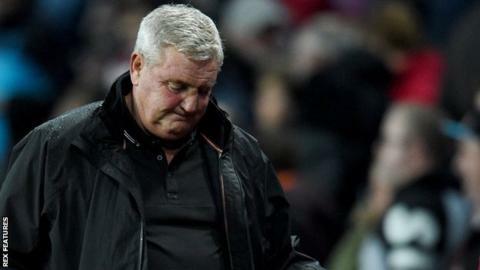 Bruce, who leaves Villa exactly two years to the day since his predecessor Roberto Di Matteo was sacked, is the first manager to lose his job in England's second tier this season. Assistant boss Colin Calderwood and coaches Steve Agnew, Stephen Clemence and Gary Walsh have also left Villa Park, with under-23s manager Kevin MacDonald taking caretaker charge of the club for the third time for Saturday's game at Millwall. "We would like to place on record our gratitude to Steve and his team for their hard work and commitment. We wish them well for the future," a club statement said. "The process of recruiting a new manager has begun." After failing to secure a return to the top flight in May that would have been worth in excess of £160m, owner Dr Tony Xia was understood to have cash flow problems. Former England captain John Terry left Villa Park, while chief executive Keith Wyness was suspended and then subsequently exited the club, before director of football Steve Round's departure in July. Villa was Bruce's ninth different role since starting his managerial career as player-boss at Sheffield United in July 1998. "There was so much turmoil in the summer about what was going on with the tax situation - yes, the new owners have come in but they came in very late, we don't know how much they are willing to throw into the club. "It was a very tough job for Steve because he was given all the funds late and trying to get players in on loan deals. I feel for Steve in that way and I feel for the club. "I feel the club is in a sticky patch at the moment and they need a little bit of leadership off the pitch as well as on it." "The decision had to be made. This club has to get promoted. "There is a quality collection of players who just need a bit of coaching and a bit of guiding, and then they will score goals. "Do I have sympathy for Steve Bruce? Yes and no. I have sympathy for him as a bloke. He went through a lot last year. But they did gamble on going up."